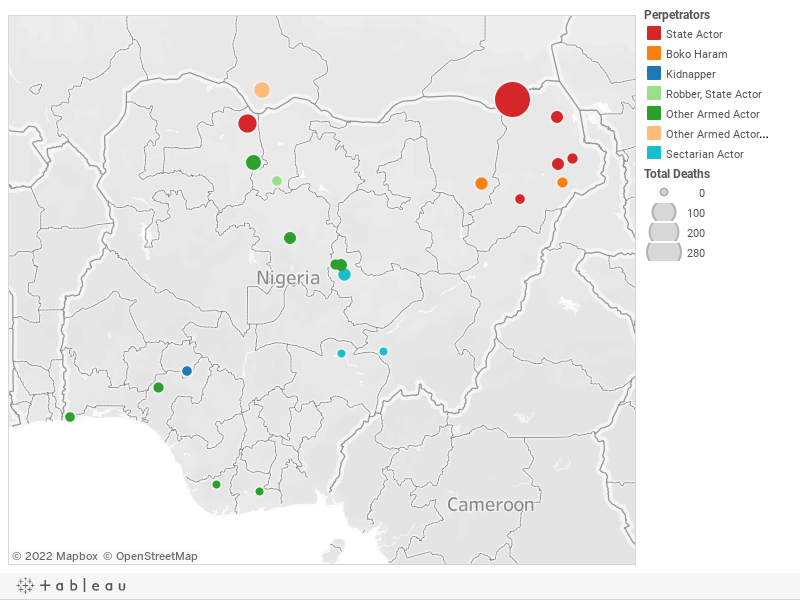 Below is a visualization and description of some of the most significant incidents of political violence in Nigeria from December 29, 2018, to January 4, 2019. This update also represents violence related to Boko Haram in Cameroon, Chad, and Niger. These incidents will be included in the Nigeria Security Tracker. December 29: Boko Haram killed eight soldiers in Gujba, Yobe. December 30: Herdsmen killed seven in Barkin Ladi, Plateau. December 30: Nigerian troops killed three would-be suicide bombers in Dikwa, Borno. Boko Haram was suspected. December 30: Gunmen killed four in Kajuru, Kaduna. December 31: Five Nigerien soldiers, five Nigerian soldiers, and eleven Boko Haram militants were killed during a clash in Maradi, Niger. December 31: Robbers killed seven in Owo, Ondo. January 1: The Nigerian Air Force killed "some" (estimated at five) Boko Haram militants in Kukawa, Borno. January 1: Bandits killed eighteen in Chafe, Zamfara. January 2: Gunmen killed six in Jos South, Plateau. December 28–January 2: Nigerien soldiers killed 280 Boko Haram militants around Zoumba, Niger (location estimated). January 3: Nigerian soldiers killed six Boko Haram militants in Mafa, Borno. January 3: Nigerian military helicopters killed "scores" (estimated at forty) of bandits in Zurmi, Zamfara. January 3: Boko Haram killed two Nigerian soldiers in Bama, Borno.